Left to its own devices, this cat talked up a storm. This cat decided to have a stuffed animal party and dragged the guests (victims?) into the living room. These dogs know they're not allowed on the couch, but when no one else is home, they also know that there's no one to stop them from doing what they want. When the owner's away, the cat will most definitely play. 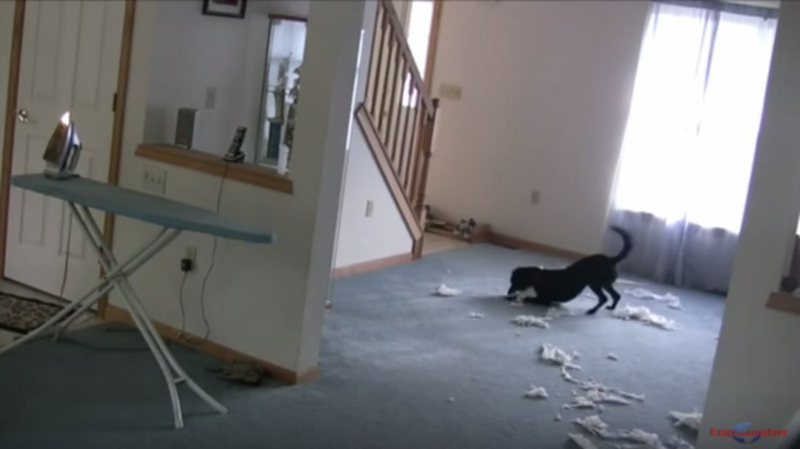 This dog decided to channel his inner rock star and trash the living room. Human-free frolicking is the best kind of frolicking. When she's not sleeping, this German Shepherd investigates every room in the house. Not even an oven heated to 325 degrees will stop this beagle from getting his share of the chicken nuggets. Sometimes these cats fight, but they spend a lot more time napping and playing with random objects. This ferret knows exactly what she's not supposed to be doing—and does it anyway. This dog knows what his owner is up to, and he isn't having any of it. Think your house is haunted? The mischief-maker might just be your cat. Rabbits don't cause that much mischief when left alone, but they sure are cute! This dog is just settling in for a good nap. These Guinea pigs couldn't care less that their humans have left them home alone. They've got their own business to attend to. Dogs know the best seat in the house is actually the bed, and when we're not home, they act accordingly.